Five stars: "If you’re a fan already you’ll love this book and if you’re not it could persuade you to give old Shakie a bash. It’s wonderful... The plot of each play is explained in conversational English, followed with the plot in a nutshell, other notable characters and a body count. There are ‘Did You Know?’ sections and quotable lines, and peppered throughout are interviews with people closely associated with Shakespeare today (actors, directors, academics and the like) which are also utterly delightful. Not only is the information that Miller has lovingly and painstakingly researched fascinating, she delivers her material in such a warm and witty style whether you’re a Will fan or not it’s an entertaining read....A light, witty, informed guide infused with love and a healthy dash of irreverence. Fab-u-lous." Five stars: "I’d have thought that Shakespeare had been done to death and that there wouldn’t be much more to offer but Beth Miller has come up with a fresh and vivacious book that I thoroughly enjoyed. Beth Miller has such a natural and lively writing style that she made me laugh out loud on several occasions with her wry and witty comments.... I studied English at University, I’ve taught Shakespeare to 'A’ level in schools and to adults in college and I still learnt all kinds of things from this smashing book. 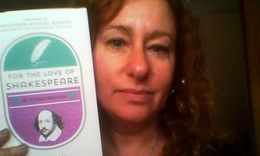 One of the joys of For The Love of Shakespeare is that it is a book you can share with readers of all ages... [It] is certainly an erudite, educational and entertaining book..., but it is so much more besides. It’s partly an autobiography of Beth Miller as we gain a real insight into how her passion for Shakespeare has evolved... it's partly a social history and a literary one. It’s partly a joke book and an insight into modern media of stage, film and television. 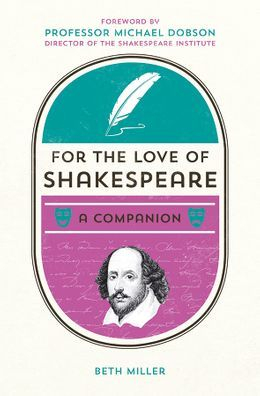 But most of all, For the Love of Shakespeare is an absolutely brilliant read and I loved it and yes, there is more faith in me ‘than in a stewed prune’!" I am sure this book will referenced many times not only by myself but also my children, how will find this easy to read and a help throughout their secondary schooling.